The Los Angeles Rams are a professional American football team based in Los Angeles, California, and compete in the National Football League's NFC West division. 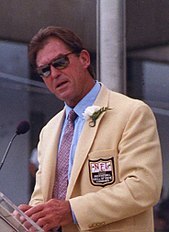 The franchise won three NFL championships, and is the only one to win championships representing three different cities ( Cleveland in 1945, Los Angeles in 1951, and St. Louis in 1999). The Rams play their home games at the Los Angeles Memorial Coliseum. The Cleveland Rams were founded in 1936 by Ohio attorney Homer Marshman and player-coach Damon Wetzel, a former Ohio State star who also played briefly for the Chicago Bears and Pittsburgh Pirates. Wetzel, who served as general manager, selected the "Rams", because his favorite college football team was the Fordham Rams from Fordham University; Marshman, the principal owner, also liked the name choice. The team was part of the newly formed American Football League and finished the 1936 regular season in second place with a 5–2–2 record, trailing only the 8–3 record of league champion Boston Shamrocks. From 1933, when Joe Lillard left the Chicago Cardinals, through 1946, there were no black players in professional American football. After the Rams had received approval to move to Los Angeles, they entered into negotiations to lease the Los Angeles Memorial Coliseum. The Rams were advised that a precondition to them getting a lease was that they would have to integrate the team with at least one African-American; the Rams agreed. Subsequently, the Rams signed Kenny Washington on March 21, 1946. The signing of Washington caused "all hell to break loose" among the owners of the NFL franchises. The Rams added a second black player, Woody Strode, on May 7, 1946, giving them two black players going into the 1946 season. The 1960s were defined by the great defensive line of Rosey Grier, Merlin Olsen, Deacon Jones, and Lamar Lundy, dubbed the " Fearsome Foursome." It was this group of players who restored the on-field luster of the franchise in 1967 when the Rams reached (but lost) the conference championship under head coach George Allen. 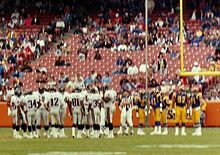 That 1967 squad became the first NFL team to surpass one million spectators in a season, a feat the Rams repeated the following year. 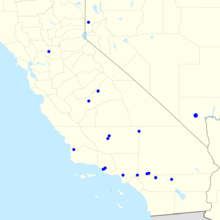 In each of those two years, the L.A. Rams drew roughly double the number of fans that could be accommodated by their current stadium for a full season. The 1999 season started with quarterback Trent Green injuring his leg in preseason play, which left him sidelined for the entire season; the starting job fell to backup Kurt Warner, who came out of college as an undrafted free agent and whose career had included stints with the Iowa Barnstormers of the Arena Football League and the Amsterdam Admirals of NFL Europe. Vermeil told the public that the Rams would "Rally around Kurt Warner, and play good football." Warner synced up with Marshall Faulk and Isaac Bruce to lead the Rams to one of the most prolific offenses in history, posting 526 points for the season. This was the beginning of what later became known as " The Greatest Show on Turf". Warner shocked the league by throwing for 41 touchdowns. This led the Rams to Super Bowl XXXIV, where they beat the Tennessee Titans, 23–16. Warner was named the Most Valuable Player of the Super Bowl. Following the Rams' win, Vermeil retired, and Vermeil's offensive coordinator Mike Martz was hired as head coach. He managed to take the Rams to Super Bowl XXXVI, where the team lost to the New England Patriots 20–17. Martz helped the Rams establish a pass-first identity that posted an NFL record number of points over the course of three seasons (1999–2001). However, in the first round in the 2004 draft, the Rams chose Oregon State running back Steven Jackson as the 24th pick of the draft. Following the 2007 season, Georgia Frontiere died on January 18, 2008 after a 28-year ownership that began in 1979. Ownership of the team passed to her son Dale "Chip" Rosenbloom and daughter Lucia Rodriguez. Chip Rosenbloom was named the new Rams majority owner. Linehan was already faced with scrutiny from several players in the locker room, including Torry Holt and Steven Jackson. Linehan was then fired on September 29, 2008, after the team started the season 0–4. Jim Haslett, defensive coordinator under Linehan, was interim head coach for the rest of the 2008 season. On May 31, 2009, the St. Louis Post-Dispatch reported that the majority owners Rosenbloom and Rodriguez officially offered their majority share of Rams for sale. They retained the services of Goldman Sachs, a prominent investment banking firm, to help facilitate the sale of the Rams by evaluating bids and soliciting potential buyers. The sale price was unknown, but at the time Forbes magazine's most recent estimate listed the Rams' value at $929 million. On the final day to do so, then-minority owner Stan Kroenke invoked his right of first refusal to buy the 60% of the team that he did not already own. The original intended buyer, Shahid Khan, later acquire the Jacksonville Jaguars after the 2011 season. Pursuant to NFL rules, owners are prohibited from owning other sports teams in markets where there is already an NFL team. At the time of purchase, Kroenke (d/b/a Kroenke Sports Enterprises) owned the Denver Nuggets, the Colorado Avalanche, the Colorado Rapids, and the Pepsi Center (home to the Nuggets and the Avalanche). Kroenke, a real estate and sports mogul married to a Walmart heir, also owned Altitude Sports and Entertainment. These interests violated the NFL's cross-ownership rule. Nevertheless, on August 25, 2010, NFL owners unanimously approved him as the owner of the franchise contingent upon his eventual divestment of his Colorado sports interests. Kroenke complied with the rule when he transferred ownership of the Nuggets, Avalanche, the Pepsi Center, and the Altitude to his son Josh Kroenke. On January 20, 2012, it was announced that the Rams would play one home game a season at Wembley Stadium in London for each of the next three seasons. The first game was played against the New England Patriots on October 28, 2012. On August 13, 2012, it was announced that the Rams had withdrawn from the 2013 and 2014 games. At this time, the Rams began negotiations with St. Louis about what steps could be taken to remediate the "top tier" requirement of the lease. On March 10, 2015, the Rams traded starting quarterback Sam Bradford and a 2015 fifth-round pick to the Philadelphia Eagles in exchange for Eagles' quarterback Nick Foles, a 2015 fourth-round pick, and a second-round pick in 2016. Foles had a 14-4 record as starter of the Eagles and an impressive touchdown to interception ratio of 46-17, while Bradford had an 18-30-1 record with the Rams. In the 2015 NFL draft the Rams drafted running back Todd Gurley. After Gurley was drafted, the Rams traded Zac Stacy to the New York Jets on May 2 for a 7th round pick. Stacy had led the team in rushing in 2013. On April 14, 2016, the Rams traded with the Tennessee Titans for the first overall pick in the 2016 NFL draft, along with a fourth and sixth-round pick in the same draft. To acquire the picks, the Rams traded away their first-round pick, two second-round picks, and a third-round pick in 2016, and their first and third-round picks in the 2017 NFL draft. On April 28, 2016, the Rams made their first selection in the 2016 NFL draft by selecting California quarterback Jared Goff first overall. The Rams opened their 2018 season on September 10 by defeating the Oakland Raiders 33–13 on Monday Night Football, scoring 23 unanswered second half points in a game during which head coach McVay took on his former mentor, Jon Gruden, who was making his return to coaching. It was the first of two Monday Night Football appearances for the Rams in the season. The Rams continued their strong start with three straight wins at the Los Angeles Memorial Coliseum, shutting out the Arizona Cardinals 34–0 in their home opener in Week 2, defeating the Los Angeles Chargers 35–23 in Week 3 and beating the Minnesota Vikings 38–31 on Thursday Night Football. Los Angeles then went three-for-three on the road with wins at Seattle (33–31), Denver (23–20), and San Francisco (39–10). Returning home in Week 8, Los Angeles rallied to defeat the Green Bay Packers 29–27 to improve to 8–0, their best start since 1969. The Rams were the only remaining undefeated team in the NFL in 2018 until losing on the road to the New Orleans Saints in Week 9 at the Mercedes-Benz Superdome. The Rams bounced back with three straight wins, defeating the Seattle Seahawks 36–31, and then winning a wild 54–51 shootout against the Kansas City Chiefs on Monday Night Football. Following a bye week, the Rams beat the host Detroit Lions 30–16 in Week 13 to clinch both a playoff berth and their second straight NFC West title. Los Angeles stumbled with back-to-back losses to the Chicago Bears and Philadelphia Eagles, but finished strong with victories over the Arizona Cardinals and San Francisco 49ers to clinch a first round bye. The Rams' 13–3 record tied for the second-most wins in a single season in franchise history and were the most ever for any NFL team in Los Angeles. The Rams began their playoff run by defeating the Dallas Cowboys 30–22 in the divisional round to head to the NFC Championship Game for the first time since January 2002. The following week, the Rams beat the Saints on the road 26–23 to advance to the Super Bowl for the first time since Super Bowl XXXVI in January 2002, and since Super Bowl XIV in January 1980 as a Los Angeles team. The game featured a controversial ending: on a third down play inside the final two minutes with the score tied at 20, Rams cornerback Nickell Robey-Coleman made contact with Saints receiver Tommylee Lewis well before a pass from Saints quarterback Drew Brees had arrived. Additionally, Robey-Coleman delivered a helmet-to-helmet hit, however, no flag was thrown for pass interference or the illegal hit, leading to outrage from Saints players and fans as this denied New Orleans a first down, which would have likely put the game out of reach. After the game, there was speculation but no clear evidence that the pass was tipped. When the team debuted in 1937, the Rams' colors were red and black, featuring red helmets, black uniforms with red shoulders and sleeves, tan pants, and red socks with black and white stripes. One year later they switched their team colors to gold and royal blue, with gold helmets, white pants, royal blue uniforms with gold numbers and gold shoulders, white pants with a royal stripe, and solid royal blue socks. By the mid-1940s the Rams had adopted gold jerseys (with navy blue serif numerals, navy blue shoulders, gold helmets, white pants with a gold-navy-gold stripe, and gold socks with two navy stripes). The uniforms were unchanged as the team moved to Los Angeles. The helmets were changed to navy in 1947. When Gehrke introduced the horns, they were painted yellow-gold on navy blue helmets. In 1949 the team adopted plastic helmets, and the Rams' horns were rendered by the Riddell company of Des Plaines, Illinois, which baked a painted design into the helmet at its factory. Also in 1949 the serif jersey numerals gave way to more standard block numbers. Wider, bolder horns joined at the helmet center front and curving around the earhole appeared in 1950; this design was somewhat tapered in 1954–1955. Also in 1950 a blue-gold-blue tri-stripe appeared on the pants and " Northwestern University-style" royal blue stripes were added to jersey sleeves. A white border was added to the blue jersey numerals in 1953. So-called TV numbers were added on jersey sleeves in 1956. In accordance with a 1957 NFL rule dictating that the home team wear dark, primary-colored jerseys and the road team light shirts, the Rams hurriedly readied for the regular season new royal-blue home jerseys with golden striping and golden front and back numerals with a white border. The white border was removed in 1958. The Rams continued to wear their golden jerseys for 1957 road games, but the following year adopted a white jersey with blue numerals and stripes. In 1962–1963 the team's road white jersey featured a UCLA-style blue-gold-blue crescent shoulder tri-stripe. 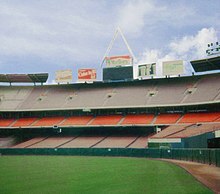 In 1964, concurrent with a major remodeling of the team's Los Angeles Memorial Coliseum home, the colors were changed to a simpler blue and white. The new helmet horns were white, wider, and separated at the helmet center front. The blue jersey had white numerals with two white sleeve stripes. The white jersey featured blue numerals and a wide blue crescent shoulder stripe. A 1964 league rule allowed teams to wear white jerseys for home games and the Rams were among several teams to do so (the Dallas Cowboys, who introduced their blue-white-silverblue uniform that season, have worn white at home ever since), as owner Dan Reeves felt it would be more enjoyable for fans to see the various colors of the rest of the league as opposed to always having the Rams in blue and the visiting team in white. The pants were white with a thick blue stripe. In 1970, in keeping with the standards of the newly-merged NFL, names appeared on the jersey backs for the first time. The sleeve "TV numbers", quite large compared to those of other teams, were made smaller in 1965. From 1964 to early 1972 the Rams wore white jerseys for every home league game and exhibition, at one point not wearing their blue jerseys at all from the 10th game of 1967 through the 1971 opener, a stretch of 48 games;  it was a tradition that continued under coaches Harland Svare, George Allen, and Tommy Prothro. But new owner Carroll Rosenbloom did not particularly like the Rams' uniforms, so in pursuit of a new look the team wore its seldom-used blue jerseys for most home games in 1972. During that season Rosenbloom's Rams also announced an intention to revive the old blue and gold colors for 1973, and asked fans to send in design ideas. Yellow-gold was restored to the team's color scheme in 1973. The new uniform design consisted of yellow-gold pants and curling rams horns on the sleeves – yellow gold horns curving from the shoulders to the arms on the blue jerseys, which featured golden numerals (a white border around the numerals, similar to the 1957 style, appeared for two preseason games and then disappeared). Players' names were in contrasting white. The white jersey had similarly shaped blue horns, numerals and names. The white jerseys also had yellow gold sleeves. The gold pants included a blue-white-blue tri-stripe, which was gradually widened through the 1970s and early 1980s. The blue socks initially featured two thin golden stripes in the middle of the blue section; they disappeared upon their move to St. Louis in 1995. From 1973 to 1976 the Rams were the only team to wear white cleats on the road and royal blue cleats at home; since 1977, they have worn white ones. The new golden helmet horns were of identical shape, but for the first time the horn was not factory-painted but instead a decal applied to the helmet. The decal was cut in sections and affixed to accommodate spaces for face-mask and chin-strap attachments, and so the horn curved farther around the ear hole. The jersey numerals were made thicker and blunter in 1975. 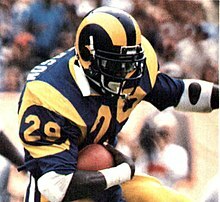 The Rams primarily wore blue at home with this combination, but after 1977 occasionally wore white at home. The team wore its white jerseys for most of its 1978 home dates, including its post-season games with the Minnesota Vikings and the Dallas Cowboys – the latter is the only postseason game the Cowboys have ever won while outfitted in their blue jerseys. The gray face masks became navy blue in 1981. The Rams wore white jerseys exclusively in the 1982 and 1993 seasons, as well as other selected occasions throughout their 15 seasons in Anaheim. On April 12, 2000, the St. Louis Rams debuted new logos, team colors, and uniforms. The Rams' primary colors were changed from royal blue and yellow to Millennium Blue and New Century Gold. A new logo of a charging ram's head was added to the sleeves and gold stripes were added to the sides of the jerseys. The new gold pants no longer featured any stripes. Blue pants and white pants with a small gold stripe (an extension off the jersey stripe that ended in a point) were also an option with the Rams electing to wear the white set in a pre-season game in San Diego in 2001. The helmet design essentially remained the same as it was in 1948, except for updates to the coloring, navy blue field with gold horns. The 2000 rams' horn design featured a slightly wider separation at the helmet's center. Both home and away jerseys had a gold stripe that ran down each side, but that only lasted for the 2000 and 2001 seasons. Additionally, the TV numbers on the jerseys, which had previously been on the sleeve, moved up to the shoulder pad. During their time in St. Louis, the Rams had worn blue at home. Like most other teams playing in a dome, the Rams did not need to wear white to gain an advantage with the heat. The Rams wore their white jerseys and blue pants in St. Louis against the Dallas Cowboys, on October 19, 2008, forcing the Cowboys to wear their "unlucky" blue uniforms, and won the game 34–14. On October 21, 2012, the Rams wore white jerseys and white pants against the Green Bay Packers. Throughout the 2016 season, the Rams' signage around the stadium, end zones, and other uses of the logo showed a variation that was only colored in blue and white, leading some fans to believe the team's upcoming rebrand would involve gold being completely dropped from the color scheme. For the 2017 season, the Rams announced they would be wearing helmets similar to the Fearsome Foursome era: Millennium blue helmets with white helmet horns and, voted on by fans, a white face mask. Fans also voted for a new pants design, which was a single blue stripe down the side of white pants, as well as an inverse design for road games. The team also began using the blue and white logo as their primary logo, confirming that they would be phasing out gold from their colors (although gold remains on the jerseys due to an NFL rule that teams must have the same jersey design for at least a minimum of five seasons, conflicting with the Rams full rebrand for 2020). The Rams also announced a fan vote via Twitter to decide two home games in which they would wear throwback uniforms. Fans selected the October 8, 2017 game against the Seahawks and the December 31, 2017 game against the 49ers, the same two opponents the Rams wore throwbacks against last season. In their Week 3 road game against the 49ers, the Rams also participated in NFL Color Rush, wearing throwback-style all-yellow uniforms with blue detailing and blue numbers, as well as yellow horns on the helmets and white stripes outlined in blue on the pants. The Rams announced on July 27, 2018 that they would wear their throwback royal blue and yellow primary color uniform for as many as five home games at the Los Angeles Memorial Coliseum for the 2018 season. In conjunction with the change, the team retired its navy blue and metallic gold uniform. The Rams' white uniform remains unchanged, and its one alternate uniform is the yellow Color Rush uniform. Additionally, the team confirmed their new rebrand would take place in 2020 to coincide with the opening of their new home arena, Los Angeles Stadium at Hollywood Park. Months after the Rams returned to Los Angeles, it was announced on June 9, 2016, CBS's O&O station KCBS would air pre-season games that are not on national television. The KCBS broadcasting team includes Andrew Siciliano (play-by-play announcer), Pro Football Hall of Fame former running backs Eric Dickerson and Marshall Faulk providing color commentary. In 2017 NFL Network analyst Daniel Jeremiah replaced Dickerson. KCBS's Jill Arrington and Rams reporters Dani Klupenger and Myles Simmons also provide insight; a pre-game show airs a half-hour before each game in addition former Rams quarterback Jim Everett and former defensive back and sports anchor/director Jim Hill provides an inside look into each upcoming game with player profiles, live interviews from booth and sideline updates and a thirty-minute postgame that provides game breakdown, film analysis, and press conference look-ins with head coach Sean McVay and select players. Spanish language game coverage is provided by Spanish-language sister stations Univision 34 (one home game) and UniMás 46 (two away games) in Spanish. In 2016, the Rams' news and highlights where shown on Rams Primetime Live on KABC-TV on Saturday nights after college football games during the regular season, hosted by sports anchor Rob Fukuzaki, sports reporter Ashley Brewer and traffic reporter Alysha Del Valle. Under the league's current national TV contracts for regular season games, Fox O&O KTTV carries the bulk of the team's games due to Fox holding the rights to the NFC contract, along with Thursday Night Football. KCBS carries Sunday afternoon games in which the Rams host an AFC team (pending any Rams Sunday game that the league later decides in mid-season to " cross-flex" between Fox and CBS). KNBC airs NBC Sunday Night Football and some selected Thursday night games produced by NBC. As for games that air on ESPN's Monday Night Football, KABC simulcasts these cable games carries those games as the two channels share common ownership. The league's blackout policy is not currently in effect, meaning that besides road games, all Rams home games are televised in the Los Angeles market, regardless of attendance. If the Chargers and Rams are both playing at the same time on Sunday afternoons on a certain network (for instance, a Rams road game against an AFC opponent at the same time as a Charger home game with an NFC opponent with both on Fox, or the reverse where the Rams are on the road against an AFC opponent and the Chargers are at home against an AFC opponent on CBS), in the Los Angeles market, Fox and CBS have authorization to carry the additional game on their secondary sister stations; Fox games air on KCOP-TV, while CBS games are aired on KCAL-TV. ^ NFL History, 1945[ permanent dead link]. Official Site of the NFL. Retrieved September 13, 2006.